As with most things in menswear, texture & simplicity are key! Grenadine silk ties are very, very textured - often mistaken for knit ties, but we prefer them over knits. Grenadine ties are woven in an open gauze weave on a jacquard loom, giving the weave extra depth and an air of sophistication that cannot be found in other solid silk ties. One of the best-dressed Bonds, played by Sean Connery, used the the strengths of Grenadine superbly, creating conservatively classic, sophisticated looks. Besides the Windsor knot used by Sean Connery, you can also wear these ties with a four-in-hand knot. Grenadine makes full knots on its own, and combined with the wool interlining we use, the four-in-hand makes a good-sized knot with a nice dimple. For more Bond style inspiration be sure to checkout the incredibly resourceful blog by Matt Speiser: The Suits of James Bond. The silk used in the Oliver Wicks grenadine ties comes from Fermo Fossati in Como - the oldest silk makers in Italy and 3rd oldest in Europe, after 2 English companies: Vanners and Stephen Walters & Sons Ltd. Fermo Fossati have been making fabrics since 1871 - and demand for their products is stronger than ever, with a considerable wait time to get this classic article. Grenadine silk comes in 2 main flavors - the finer Garza Fina and the wider Garza Grossa. 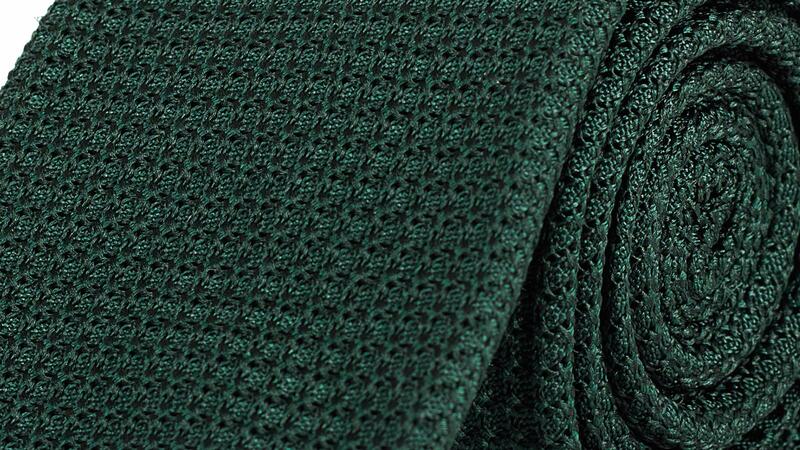 We only offer Garza Grossa, since it best shows the character of the fabric. For extra visual interest and to better match the classic ties worn by Sean Connery, our ties are made from the wrong side of the fabric which is even more textured. The standard tie width is 7.5 cm / 3'' and generally looks good on everyone. Please do not obsess with matching the width of your ties to your lapel width: a 3'' ties looks equally good with a 2.5'' lapel and a 3.75'' lapel. That is not to say that proportions do not matter in menswear. If you are wearing a jacket with super slim 2'' lapels and opt for a 4'' wide 90’s kind of tie, it will probably look like you are wearing a bib. All the more reason to stick to medium width 3'' ties! You can browse our tie collection, which includes grenadine and other classic designs here.